Unsupported major.minor version 52.0 comes when you are trying to run a class compiled using Java 1.8 compiler into a lower JRE version e.g. JRE 1.7 or JRE 1.6. Simplest way to fix this error is install the latest Java release i.e. Java 8 and run your program. If upgrading to Java 8 is not an option then make sure you use Java compiler's cross compilation feature and compile source code for lower Java version by using -target option of javac command. If you have multiple JRE installed make sure that the latest one comes first in PATH environment variable. You can get "java.lang.unsupportedclassversionerror unsupported major.minor version 52.0" while running a Java program explicitly using java command or running a Java Applet in browser or running a Java program from command line but compiled in Eclipse or any other build tool like Maven or ANT. Main reason of this error is that during compilation, you have used a higher version of JDK but during deployment, you have deployed into a lower version of JDK or JRE. Let's understand the cause and solution of Unsupported major.minor version 52.0 Error in little more detail. TL:DR; upgrade to Java 8 or compile for lower JRE version using java -target 1.6 option. Many people think why do you get a version mismatch error if Java is backward compatible. Well, its true that Java is backward compatible, which means you can run a Java class file or Java binary (JAR file) compiled in lower version (java 6) into higher version e.g. Java 8, but it doesn't mean that you can run a class compiled using Java 7 into Java 5, Why? because higher version usually have features which are not supported by lower version. You can see that Java 8 has major version 52, which means if you run javac command from Java 8 installation, it will by default generate a class with major version 52. If you run this class file in JRE 7, you will get "Unsupported major.minor version 52.0". Same is the case with an applet compiled in JDK 1.8, running in a browser with JRE 1.7. The Helloworld.class file generated by this command can be run in any version of Java 1.4 onward e.g. Java 1.4, Java 5 or Java 6. As I said earlier, there are two ways to fix "Unsupported major.minor version 52.0" error, first upgrade to higher Java version or compiler Java source files for lower Java version of target environment. If you are getting "java.lang.unsupportedclassversionerror HelloWorld unsupported major.minor version 52.0", which means Java version in your PATH is lesser than Java 8. If you already installed the JDK 1.8 then its due to incorrect PATH setting. If you have multiple JRE version installed then lower version is coming ahead in PATH than higher version. To fix this, examine your PATH environment variable and make sure the latest version of Java comes first. You don't need to touch your CLASSPATH, because its not a classpath issue. Remember, difference between PATH and CLASSPATH. If you cannot upgrade to higher Java version e.g. your production is running on JDK 1.6 and your latest release is failing due to "Unsupported major.minor version 52.0" error then you need to fix your build environment. Make sure to install the same JDK version for building your Java application as you are going to run in production. If that's not possible, use Java compiler's cross compilation option to generate class file for your production Java/JRE version using javac -target option. 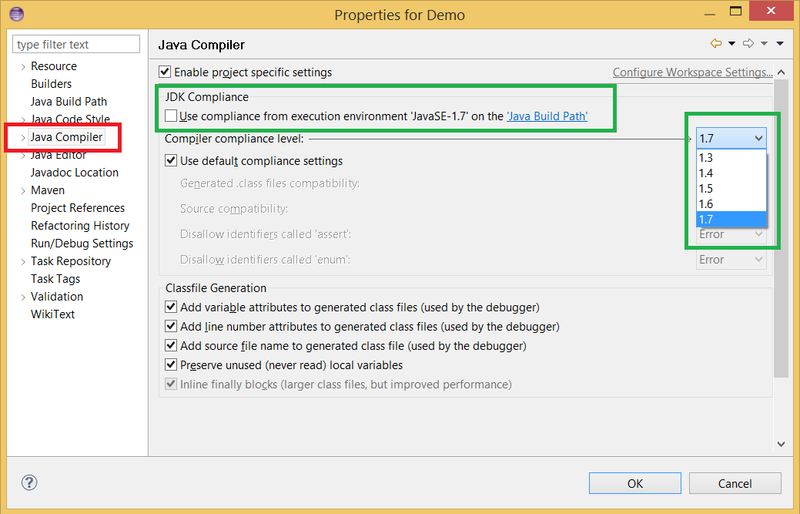 For example, if your build environment is using Java 7 and your production environment is using Java 1.6 then compile using java -target 1.6 option to generate class files for Java 6. If you are trying to run an Applet from a website (internal or external) then you don't have any control on build or compile step. Your only option is to upgrade the JRE plugin of your browser to Java 8. Once you done that you should be able to run the Applet compiled in any Java version without any issue, remember Java is backward compatible. BTW, from Java 8 onward security has been tighten and you cannot run an unsigned or self signed Applet in Java, especially if you have HIGH security setting in Java Control Panel. Java 8 has also removed the MEDIUM security settings, which earlier shows warning when you run such Applets. That's all about how to fix Unsupported major.minor version 52.0 Error in Java. In short, you are getting this error because it is compiled with Java 8, source version 52 corresponds to Java 1.8 release but you are trying to run this program in lower JRE e.g. Java 7 or Java 6. This means you have two solution, first upgrade to Java 8 or compiler your program for lower version even if you are using Java 8 compiler by using -target option of javac command. If you are using Maven, ANT or any other build tool to generate your class files, make sure they have got the right settings too. Hi Javin. First of all many thanks for creating such a great site for learning java and passing interviews. Menu on the left was very helpful as it was topic based. Please restore that if possible. thanks a ton, I was getting very same error in Eclipse and your solution saved my day. "java.lang.UnsupportedClassVersionError: Helloworld : Unsupported major.minor version 51.0"
then it could also be due to your compiler setting is set to JDK 1.7 compliance level and you are using project JRE or default JRE which is now pointing to Java 1.6 version. The Eclipse / Java Compiler part helped.. Thanks!! Thanks lot. You saved my day. i built and ran the application using jdk1.8 but still i am seeing the same issue. Thank you! Help a lot, bro!! still it is not this exception is coming. Thanks a lot Javin, i was not able to understand the root cause of this problem in my eclipse. got the solution. it works fine now. Really thank you. You save my day.